Finished puzzle size:11.5" X 16.25"
Individual piece size:2" X 1-3/4"
This puzzle offers a higher level of challenge and the larger finished size works well for people working together to complete a puzzle. Puzzle is 11.5 X 16.25 when completed and is made of a thick, durable chipboard. 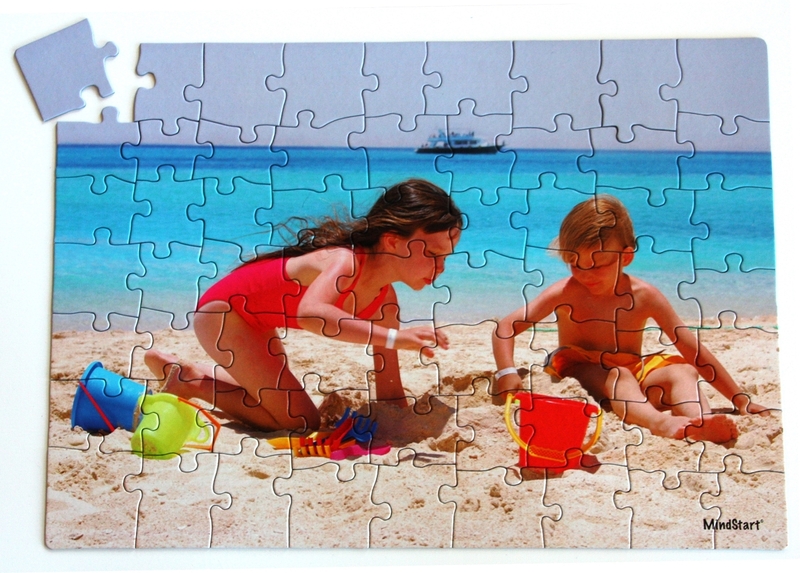 The puzzle image recalls memories of swimming and playing in the sand as children, along with the sights and scents of summer. Consider for Mild Cognitive Impairment, very Early-stage dementia, and adults who want something simpler and faster than traditional adult puzzles. I purchase Mind Start puzzles for my husband who had a stroke and has mild cognitive impairment. He really enjoys these puzzles as they are easy enough for him to work without causing frustration. He has now has all that are available and likes them all.